A move of premises for a Spennymoor based company required Holt Storage Systems Ltd to dismantle and rebuild over 200 bays of racking. In total 190 bays of Dexion MK3 racking along with guiderails were dismantled and rebuilt in four phases, allowing the client to off load a few racks at a time and reload them at their new premises when built. 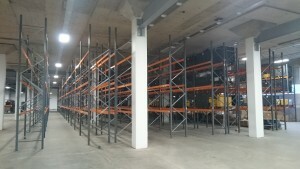 This phased programme ensured the client did not have to empty all the racks at once and allowed them to continue with their day to day picks, keeping disruption and floor space requirements for out-of-rack products to a minimum.